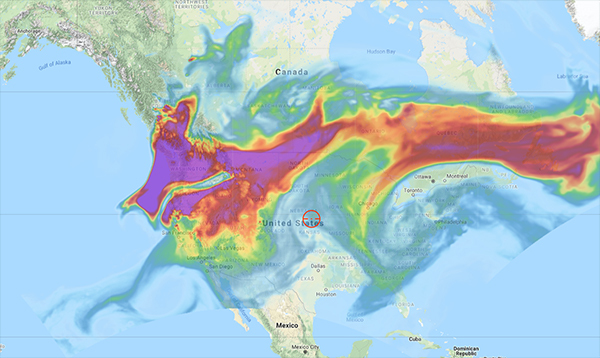 Smoke from wild fires on the West Coast and other locations on our continent have impacted most everyone in North America. The image above shows how the smoke has traveled from the California forest fires, as well as forest fires raging in British Columbia. To those directly impacted by these fires, stay safe! Today I'm announcing an upgrade to the Enhanced Transparency forecast produced on Astrospheric. The forecast now includes Smoke data to better model the transparency of the atmosphere above you. Both Smoke and the Enhanced Transparency are available to view on the map. Special thanks to the fine folks at NOAA for making this experimental data available to me. They've provided access, answered questions, and even written code to help me access the data even faster. *Please note* The older Transparency forecast produced by Allan Rahill (CMC), which only takes water vapor into account, will no longer be available on Astrospheric later in September. Please read the info below to try out the new Enhanced Transparency forecast now! View the enhanced model on the map by turning on Transparency, then choosing either the Enhanced view or Smoke view. Turn on the new transparency model in your forecast and provide feedback! Tap the transparency icon again to provide feedback, or to turn the model off.